This 3' x 6' lino cut was wallpapered onto the clinic in Art As Medicine/Medicine As Art. 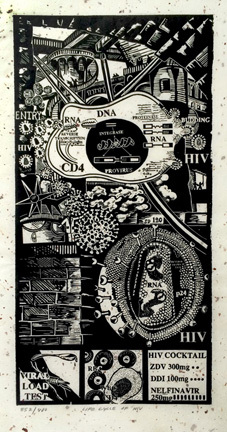 It shows the lifecycle of HIV as it enters a lymphocyte. This is further explained in "Pictures That Give Hope". 72x32.5”. Edition: 20-Price Available on Request.